To commemorate this milestone and in the spirit of outrageous fun and giving, this fortunate 10,000th visitor will receive a $10K money prize $10 Takashimaya gift voucher kindly sponsored by a Mr Anonymous. Simply drop a comment- “I am the 10,000th visitor!” in this entry and register with your email upon seeing that you have clocked in 10,000 hits from this site’s “blog stats” located on the bottom right of this page. Only upon verification of site moderator will 10,000th visitor be contacted for voucher to be delivered. Am I the 10,000th visitor? so Am I the 10,000th visitor now? doing this will make me the 10,000th visitor right? Alamak… couldn’t trace the 10,000th visitor. oh btw, you still owe me 10 bucks on top of the voucher! Using the Singapore Tourism Board’s marketing gimmick. 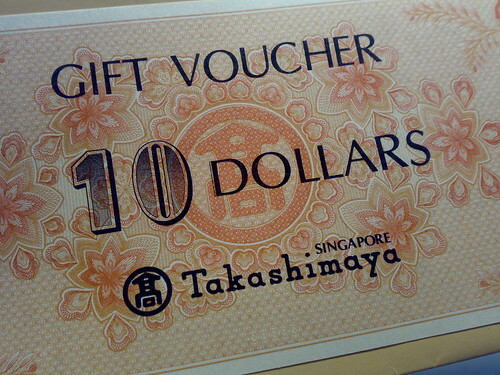 Maybe you can ask Takashimaya to sponsor you a $100 voucher; you bartering the ad for them. Or you a free ticket (Invitation to Church – you made your own ticket). Or offering a lunch voucher (a chance to dine with future Warren Buffett – if you claim yourself to be one). Or offering a land deed in Venus, that you do not need to fulfill. Or simple tell them……. This is a joke.